As many of you know, I had a baby 4 months ago, and since then my skin has drastically changed. Before I became pregnant, my skin was bright, a tad bit oily but for the most part, "normal" Now my skin is dry patchy, flaky and dull. I was planning on reviewing Lumixyl last year, but when I found out I was having a baby I stopped all skin care products. So now that I'm back to my regular self, I decided to try out the Lumixyl Brightening System. I have tried other Brightening Systems in the past, with amazing results. I bought one at my doctor's office a couple years back, and I was more then pleased so I knew I wanted to try another brightening system. I had heard that Lumixyl was a good one, so I decided there was no better time then now to see if the hype was true. "The LUMIXYL Brightening System is a revolutionary multi-faceted system that dramatically improves the appearance of hyperpigmentation tolerably and without the side effects associated with prescription Hydroquinone or retinoids. This professional skincare system builds on the success of the Lumixyl Topical Brightening Crème introduced in 2009. An innovation in skin brightening technology, the four products in the Lumixyl Brightening System work synergistically to target existing hyperpigmentation and to prevent its recurrence. For most patients these formulations can eliminate the need to use hydroquinone or its bi-products, which are controversial due to their potential side effects. Lumixyl products are proven to be powerful but gentle on skin. The 4 step system offers a complete approach to brightening that is sustainable, effective and more tolerable than competitive brightening systems that contain hydroquinone. I have extremely sensitive skin, and for 4 weeks straight I used nothing but the Lumixyl System. I have to tell you to be VERY careful because living in Arizona, the sun can be extremely intense. When you are using a brightening system, you want to make sure you wear the sunscreen lotion provided in the kit, because if you don't you can easily burn, a mistake I had to learn the hard way. Just having my window down in the car caused me to get a bit of a burn on my chin. The formula contains caprylic/capric triglycerides, glycerin, sodium PCA, pentylene glycol and cetearyl alcohol, all powerful ingredients so following the instructions is important. Other then my slight mishap, the Topical Cream did burn my face a bit when applying but after speaking with their amazing customer service, I found I was using too much at one time and layering up the creams while I should have been putting a thin layer. After about a week my skin was itchy dry and flaky, something I had experienced with my previous brightening system in the beginning but ended with fabulous results, so I chalked up the dry skin for a couple weeks. I had a hard time putting any type of makeup on because my face was so dry and red. After 3 weeks of snake skin, I decided to ease up on the Lumixyl. I stopped using it at almost the 4 week mark and wow my skin looked great. My freckles and sun spots were gone and my skin tone was brighter and luminous. So although my experience was uncomfortable, the end result was good. I've heard from many others that Lumixyl worked wonders for them and that the itchy dry patchy skin I had experienced never happened to them, so it was a bit of a mystery why I was having such strange side effects. I kept trying to figure out what I did wrong to have such different results then others. It's hard to write a review knowing what I know now about my skin condition, but I can say Lumixyl is worth the money and if used correctly each day you will achieve the results promised by the brightening system. In the last couple weeks I have discovered I have an auto immune disease that I will talk about in an upcoming post that leaves my skin dry flaky and patchy. I've been contemplating if I would use the Lumixyl System again, knowing what I know now about my skin condition and the answer is simply yes I would. I did suffer a bit because of my skin disease, but I still achieved a brighter fresher face. I think people that have normal, dry and even oily skin will all benefit from Lumixyl and probably won't have any side effects. I've decided I will use it again in a couple weeks before it gets too hot out, the results are absolutely worth it. 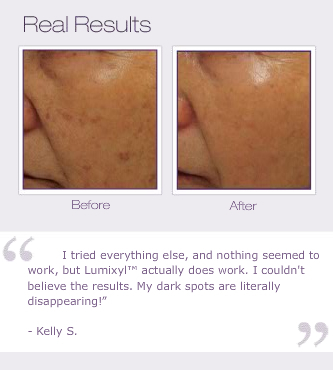 I think people with sun spots or dull skin will be the ones that will benefit the most from Lumixyl. Years of tanning has done damage to my face, Lumixyl has reversed that damage. You can find out more about Lumixyl Brightening System on their website. The Giveaway: One winner will win a tube of Lumixyl RevitalEyes ($65) Easily my favorite product from Lumixyl, this eye cream really brightens your eye area and leaves you looking fresh and awake. Love it! I would like to win this for old acne scars!